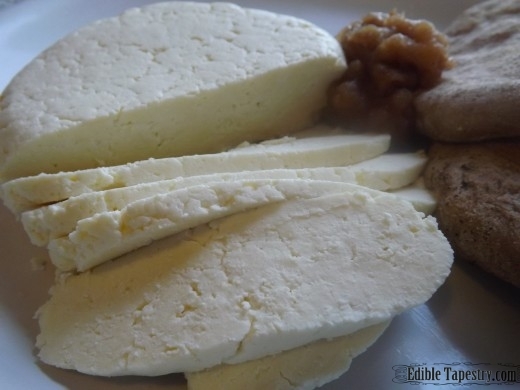 I’ve been making paneer for several years, mainly because I have trouble finding rennet and cheese cultures where I have lived, which are required for most other cheese making processes. 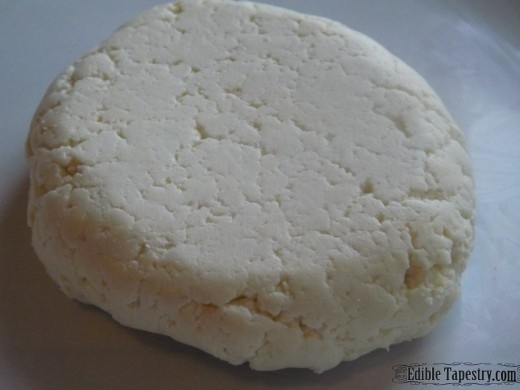 I only need milk, salt, an acid and a few minutes to make paneer, and employ virtually the same method as the one I use to make fresh ricotta to create a soft block of Indian cheese. Paneer is mild and delicious alongside other Indian dishes, or melted inside a round of naan with a little chutney. Breakfast, lunch, dinner, snack time…I always seem to find an excuse for enjoying the latter. I made this batch to go with the potato samosas I fried up that were inspired by Julie Lawson Timmer’s Five Days Left, and enough whole wheat naan and apple chutney to keep me smiling through several snack times. 1/2 gallon whole, full-fat milk. 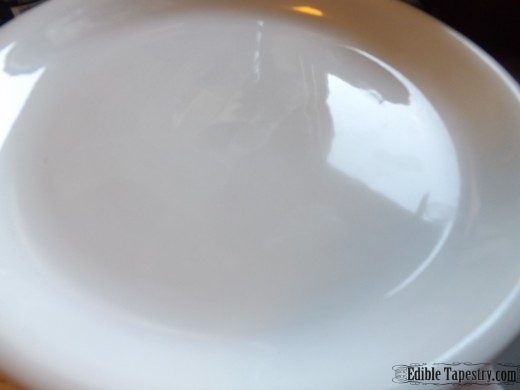 I used non-homogenized, raw cow’s milk. 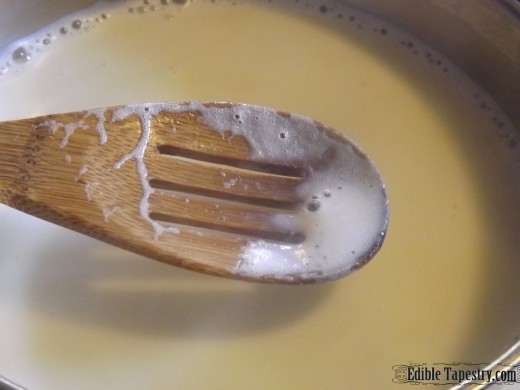 Scald the milk in a large saucepan until it almost begins to simmer. 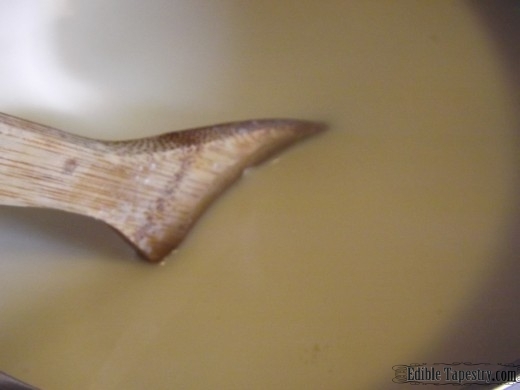 Be careful not to let the milk scorch by occasionally stirring it. I don’t even use a thermometer, though the milk should be between 195 and 200 when it is foamy and hot, and ready for the acid to be added. 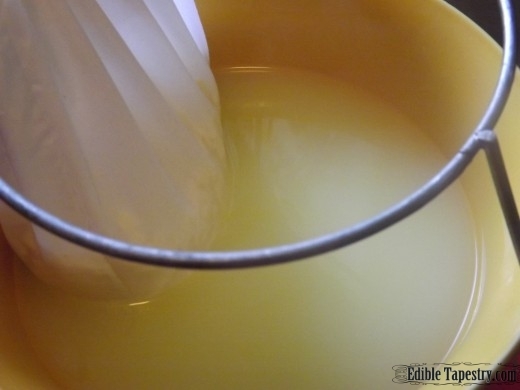 Remove the pan from the heat and gently stir in the acid. 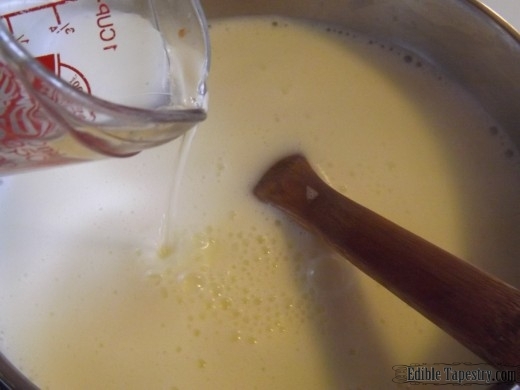 Avoid whipping or vigorous stirring, just move it around enough to combine the milk and the acid. It should begin to curdle right away. 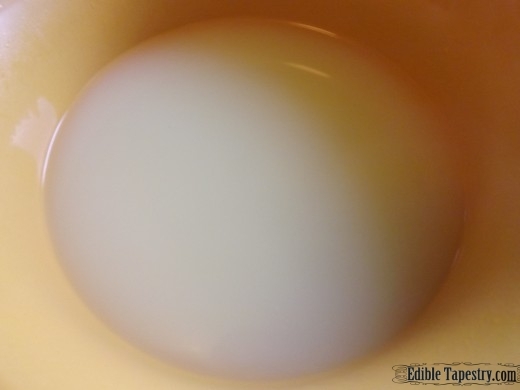 Allow the mixture to sit for a few minutes. Just go brush and floss or something, and when you come back…cheese! 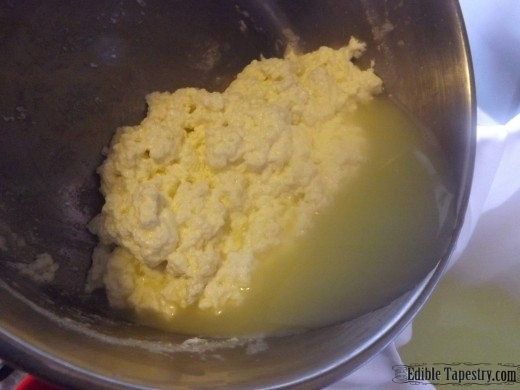 The curds will be lying in a nice little glop at the bottom of the pan, and the milky whey will be pooled around it. 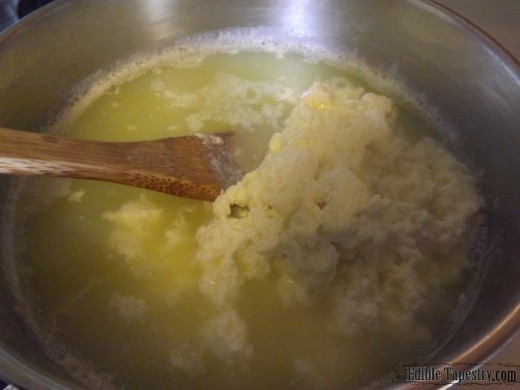 Pour the whole pan of hot curds and whey through a jelly bag or several layers of cheesecloth set inside a colander. 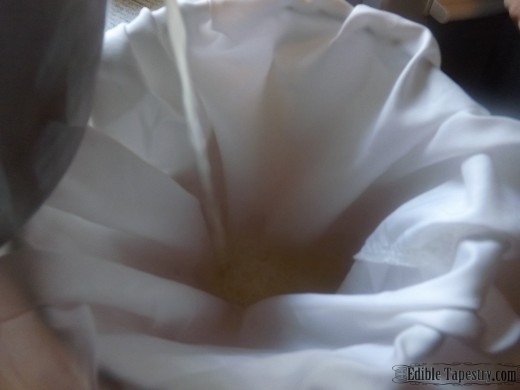 I just hang mine from the frame of my chinois stand which frees my hands up for pouring the pot of cheese. 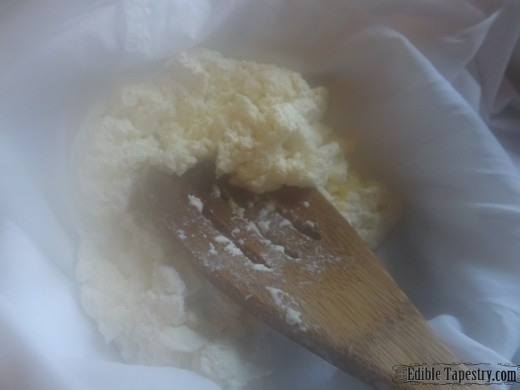 The cheese will be very hot so be careful, but at this point, twist the bag or pouch of cheesecloth to squeeze the whey from the curds. 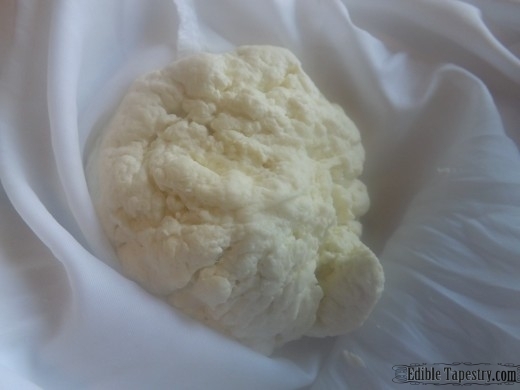 Keep squeezing until the soft cheese is all that remains in the bag. 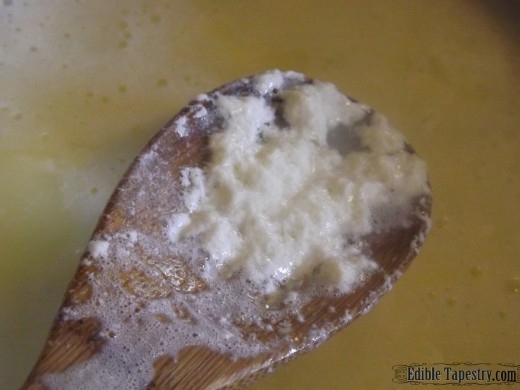 Stir salt into the cheese until it tastes just right. Save the whey for using in other recipes. 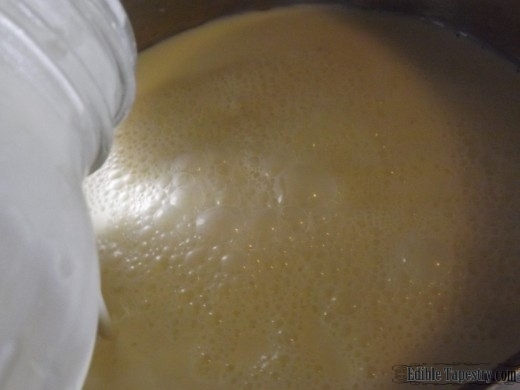 I have been using it in place of buttermilk, and to make German Braunkäse, and something like a sweetened condensed milk. Wrap the cloth over the round of cheese. Place it on a plate and place another over it to press it. Chill until ready to use. « The 73rd Annual Preston County Buckwheat Festival.